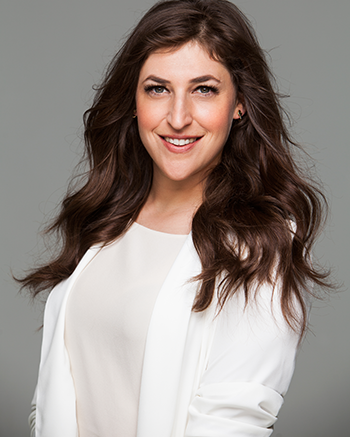 Most people recognize actress Mayim Bialik from CBS’s hit sitcom The Big Bang Theory, from the older series Blossom or from the film Beaches. Less well known is that she is one of the few celebrities who publicly identifies both as Jewish and “observant-ish”; her red carpet jewelry almost always includes a Star of David necklace or bracelet. Bialik is a staunch supporter of Israel, even when facing anti-Israel commenters on social media. The 41-year-old Los Angeles resident and mother of two sons founded her own web community, GrokNation, in 2015, covering topics such as politics, faith, Hollywood and women’s issues. She is the author of Beyond the Sling and Mayim’s Vegan Table. Her third book, Girling Up: How to Be Strong, Smart and Spectacular, is due out in May. This interview was edited for brevity and clarity. Most people know you from your acting work, but you’re also a trained neuroscientist. How are you feeding your inner scientist? No matter what you do with your life, the things you learn as a scientist change the way you view the world. Having that knowledge base informs everything I do, whether its interpreting the news or being amazed at the way condensation works and how clouds function. Those wonders are also ways that I’m in touch with God all the time because all of that is Divine to me. It’s such a blessing to be able to view the world like that. Why was writing Girling Up important to you as a woman and as a mother of two sons? It’s important to me as a former girl who never fit the mold and who, as an adult, still doesn’t really fit in. On GrokNation.com, I wrote about how challenging it was portraying [The Big Bang Theory characters] Amy and Sheldon becoming intimate for the first time; this became a book on the entirety of the female experience. It’s been a real labor of love. I hope that it impacts a lot of young women and the people who love them. Raising feminists is important whether you have girls or boys. The true perspective of feminism is to understand male and female qualities, the importance in the similarities and in the differences, and also to seek to elevate all people who don’t have a voice. How does being a vegan restrict or enhance your experience of Jewish food? There are ways to be observant in a culinary way that do not involve meat or dairy. The seder plate represents a challenge with the zeroah [lamb shankbone, or chicken wing or neck] and beitzah [egg], but there are talmudic references to people who substituted mushrooms or beets. I don’t like mushrooms so we use beets. We use a wooden darning egg or an egg shaker that you can get at percussion stores. Eating in without consuming any of the forbidden grains, and also without eating meat, eggs and dairy, is a bit of a challenge, so Pesach becomes a detox; we basically eat no processed foods. This Passover, what can we learn about freedom and our role in achieving or maintaining it? Passover has provided us, for thousands of years, with the opportunity to revisit the core principles of our Jewish identity that surpass political parties and the social media mess that many of us find ourselves in: Let all who are hungry come and eat, and we sit and communally remember what it’s like to be strangers and wanderers and to be kicked out of a place that could not hold us, so we can be redeemed into freedom. This year, we will think about what’s going on in the world and use the messages of Pesach and the messages of Judaism to find strength, to continue to be a light among nations as we seek to make the world better. What’s the most important thing you do? The most important thing for me is to be a present parent who teaches the values of the Jewish people and seeks to show my children [Miles, 11, and Frederick, 8] how to be living examples of the Divine in everything they do and everything they touch. I try to impart information that I hope is meaningful and that can in some way transform the world in positive ways. Esther D. Kustanowitz is a Los Angeles-based writer and editor. She is also editorial director of GrokNation.